The New Zealand Story (ニュージーランドストーリー, Nyū Jīrando Sutōrī?) 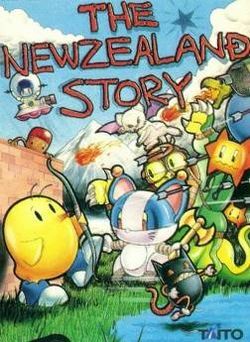 (also known as Kiwi Kraze in its American NES version) is a 1988 arcade game by Taito. The player controls a sneaker-wearing kiwi called Tiki, and the aim of the game is to rescue several of his kiwi chick friends who have been kiwi-napped by Wally, a large blue walrus/leopard seal. The player has to navigate a scrolling maze-like level, at the end of which they release a kiwi trapped in a cage. The game shares several elements from previous Taito games (such as collecting letters to spell out "EXTEND", from Bubble Bobble). This page was last edited on 10 March 2010, at 02:52.